Our notes feature allows you to keep track of reminders and information that is for your eyes only. Even if you embed your planbook on a school website, turn in plans to an administrator, or collaborate with colleagues, only you will be able to view your notes. 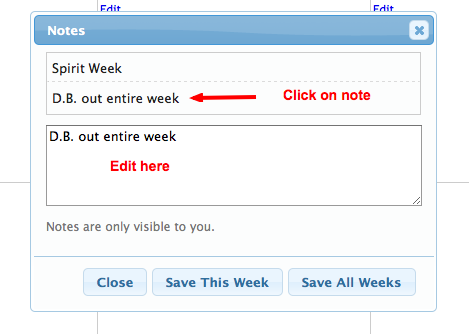 To add a note, click on the yellow note icon in the weekly view. You can enter as many notes as you'd like, and decide whether you would like the note to show up only that week, or for all weeks. Once a note is saved, it will appear in the Notes window above where you entered it. You can close the Notes window by clicking the "X" and come back to it at any time by clicking the note icon in the weekly view. You can edit a note by clicking on it. The text will appear in the editing box. To remove a note, hover over it so the red "X" appears, then click the X. *You can move the Notes window around your planbook by dragging the top of the Notes window. To resize simply drag any of the corners.